1. On a clean surface, roll out the pack of air-drying clay with a rolling pin. 2. Use cookie cutters to stamp your desired shapes and remove the excess clay. 3. Stamp the Twitter handle or name onto the clay, taking care not to snag or dent the surface with your fingers. 4. Use a darning needle to make a hanging hole at the top of the shape. 5. Leave to dry for at least 24 hours and then string with bakers twine. 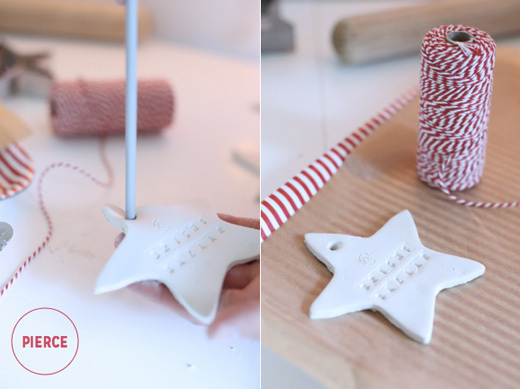 Have you tried any stylish Christmas DIY’s this season? I’d love to know your ideas for making things personal! I think I’ll try and make mini ones for gift tags this weekend. Thank you for sharing the instructions! @Bea – A lovely idea to personalise your pressies! Too cute! I love how it looks hanging on the tree in the last picture. I will pin this idea and insert it in our Advent calendar next year. The only thing I did myself this year was the Advent wreath. I used a large plate, 4 cream pillar candles on which I made a bow at a low level with a green ribbon. I then spread linen seed mixed with cinnamon (for the smell) around the candles on the plate. Oh, I also did my son Advent calendar… A green ribbon pinned on a wall in the shape of a Xmas tree. I used brown paper bags and made the numbers myself… They were hung with small wooden cloth pegs. @FunkySteph – Those sound like really fun festive crafts! Merry Christmas! I’ve done them for Christmas placeholders! @Serena – I love the idea of making them as Christmas placeholders. Merry Christmas! These are super cute – where do you get the clay from? And do you think rather than the stamps we could write on the clay? @Sharmee – I bought the clay and stamps from Hobbycraft. I did the ‘@’ by hand and the letters with the stamps so you could try it all by hand but I fear it would be quite tricky! Wish I had seen this post earlier, as I have three children in the house who would have loved creating something like that tomorrow. But we are done with the preparation and tomorrow is a stay-home-and-relax day. Happy Holidays Will! 2014 is going to be so exciting for you with your book and I bet many more ventures. Love your little DIY project. I also make them each year either as gift tags or ornaments, or name place cards tied on a napkin. Big hug! Great ideas. I will do that in this Christmas. @Domestikate – Oh, it’s so charming! Thanks for sharing.